Beginning in 2014, individuals and employees of small businesses will be able to purchase health insurance through health insurance markets commonly known as the “exchanges.” Open enrollment for health insurance sold on the exchanges begins October 1, 2013. The Affordable Care Act (“ACA”) requires certain employers to provide their employees notices describing the exchanges, the open enrollment period, and potential tax credits available for employees who purchase insurance on the exchanges. The notice requirement applies to all employers who are subject to the Fair Labor Standards Act (“FLSA”). Unlike other requirements under the ACA, the exchange notice requirement applies to all employees, regardless of the employee’s enrollment status under the employer’s health plan or status as a full-time or part-time employee. Employers must provide the notice to current employees by October 1, 2013. Following October 1, 2013, employers must continue providing notice of the exchanges to all new employees at the time of hiring. While the ACA requires employers to begin distributing the notices by October 1, 2013, the Department of Labor has indicated that it will not seek penalties for violations of this requirement at this time. However, employers should still attempt to comply with the ACA requirement by providing the notices by the October 1 deadline to the greatest extent possible. If an employer discovers that it has missed the October 1 deadline, it should distribute the notice to all employees as soon as possible and distribute the notice to new employees going forward. Although a penalty will not apply for failure to timely distribute the exchange notice, there may be other negative consequences under ERISA for failing to satisfy the requirement. 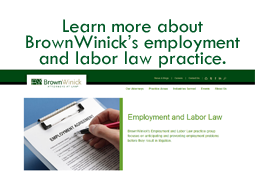 If you have questions regarding whether the exchange notice requirements apply to you, or if you require assistance drafting an exchange notice which complies with the ACA requirements, you should contact your BrownWinick employment law attorney.